Over the last 35 years I have created events for charities, villages, business organisations and City Councils from the FASHION EXCHANGE to sell designer, second hand clothes, APPLE PRESSING DAY for the Cotswolds to the GREAT BRITISH CHEESE FESTIVAL which attracting up to 10,000 visitors, exhibitors from around the world and was held over 15 years at wonderful venues from Blenheim Palace to Cardiff Castle and finally my village Green! I love creating events so choose from the two below that can be adapted to your time and budget or let me create a Bespoke event just for you. 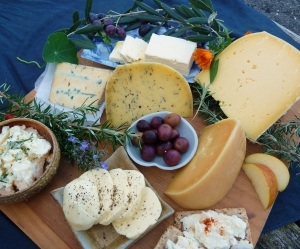 A celebration of the amazing diversity of Hawke’s Bay wine, cheese, cider, olives and fresh produce. A unique evening typically with a cheesemaker but can be a winemaker, olive oil producer, cider maker, sausage maker or pickle expert! From private parties to fund raisers, quiz nights to quirky tastings, team building or just a great night out with friends. Classes from 8 – 18 can be held at my home at Black Barn. Large groups or individual event can be held at a venue of your choice. The style, size and content can be adapted to any age, location, event or business. So email or call me to discuss the possibilities.